i’m one of those knitters who has a few ufo’s. ten of them right now. and six wip’s. i don’t think that’s a whole lot. i’ve seen people on ravelry who have a lot more than i do! but i’m not here to make excuses, what i wanted to tell you is that one previous ufo is now a nice and healthy wip! i have picked up the old short-sleeved diamond stitch sweater (ravelry link) by sarah dallas from vintage knits! i’d already finished the back, but i fear that it’s turned out too big. but i’m not messing with that part now, i finished one sleeve today and i’ve just started on the front. with smaller needles. so there’s hope for the old jumper yet! so, in this case sarah dallas has stayed fairly true to the original. some of the other patterns in the book differ more from the originals. about two years ago, i started knitting a slipover based on a vintage pattern from 1946. i decided to call it gosford park, because it reminded me of the stylish clothes worn in the movie. it was a simple knit and purl pattern. but it just wouldn’t work out. i wasn’t happy with the structure, i was indecisive on the shape and struggled with the depth of the v-neck that i wanted to add. i think i’ve frogged it and re-knit it more than four times so far. it’s been out in the cold for quite some time. but a few weeks back i felt like picking it up again. speaking of summer, i just made my first rhubarb pie for the season! it was delicious. a few weeks ago a visited mexico on a short business trip. this was just before the flu outbreak hit the media. i came back with a cold. no, it wasn’t the swine flu, just an ordinary cold. i already had a fever when i arrived in mexico city airport. anyway, due to the cold, i hadn’t really the energy to do much while i was there apart from work. but i went for a short walk to find the post office. and on my way i happened upon a yarn shop! 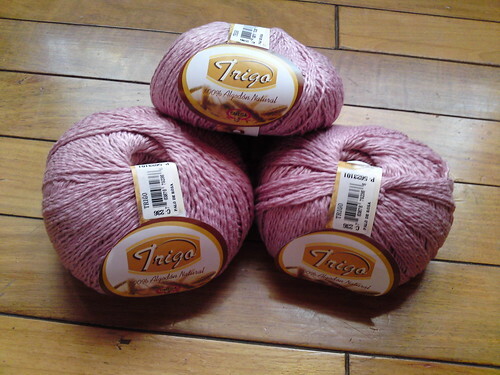 they carried mostly acrylic yarn, but i did find a nice soft cotton yarn. i don’t know what i’ll do with it, but that’s ok, i bought it mostly as a souvenire. i just have to show you what stefan gave me the other day: a bed tray with E.T. on it! isn’t it wonderful?! i love it! when i was at home from work with the cold, stefan felt sorry for me because i had no place to put my mug of tea when i was reading or watching tv in bed. so he tried to find a nice bed tray. apparently, bed trays are really ugly, and after days of searching the internet, he found this second hand, “vintage”, object. lucky me, because i just love E.T.! it’s one of my favourite movies. i even bought a red hoodie many years ago like the one eliott wears in the movie.